Over a year ago, I had the distinct honor to attend a panel in memory of my hero in the realm of film criticism, the late Roger Ebert, in Cannes. His widow, Chaz, was in attendance a little over a month after his passing. 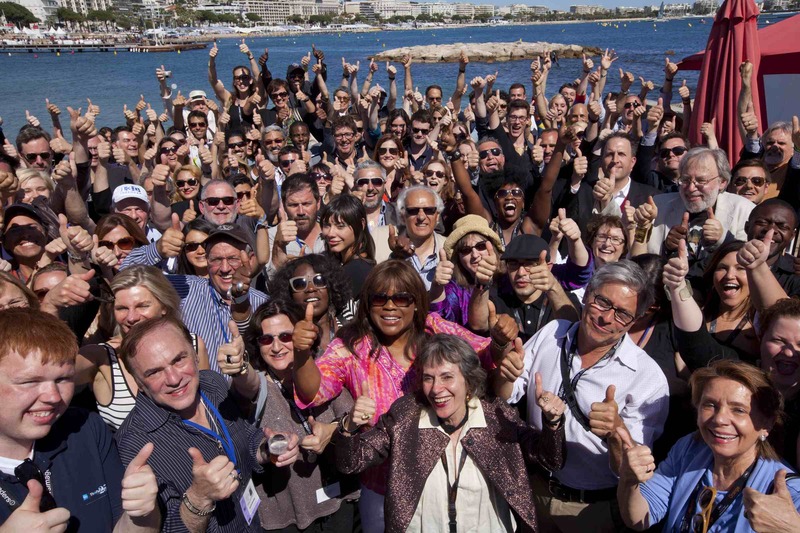 We all took a “500 Thumbs Up for Roger” picture (if you like a good Where’s Waldo puzzle, try to find me in this picture) and signed a book letting Chaz know how much her husband meant to everyone who cherishes film. People that take the time to write seriously about these illusionary worlds of light, shadow, and pixel have most likely achieved this exhilarating narrative transport. It’s a difficult and thus extremely rare feat for a film to pull off. Yet the sensation feeds the soul in such a sublime manner that it’s worth seeking out even if it means wading through seemingly endless mediocrity. By year’s end, I manage to let the awards hype delude myself into thinking I have experienced this transcendent feeling multiple times. In actuality, however, these little miracles only occur every few years or so. I’m overjoyed to report that James Gray’s “The Immigrant” is one such film. Most movies nowadays return me to the same spot from which I departed. This masterpiece, on the other hand, picked me up at one place and deposited me at a higher ground. The story of “The Immigrant” alone left me feeling spiritually enriched. The complete package assembled by producer, writer, and director Gray left me renewed and reaffirmed in the power of the cinema. I remain so stunned in slack-jawed awe at this exquisitely beautiful work that few words can fully capture my strong sentiments. “The Immigrant” tells the story of a very specific immigrant experience, that of Ellis Island in the 1920s. After World War I showed Europeans the horrifying range of human atrocity, many flocked to America in the hopes that they could leave their traumas behind and start fresh in a land of boundless opportunity. Gray opens the film with a shot of the United States’ most visible beacon of hope – the Statue of Liberty – and a palpable sense of optimism from two Polish sisters who just disembarked. Almost immediately, however, they find that their mythologized America is not exactly as they expect it. The authorities quarantine Magda Cybulska on the island, leaving her sister Eva (Marion Cotillard) to fend for herself. Not allowed into the country unescorted and deemed a “lowlife” from the journey, Eva finds herself on the verge of deportation. Luckily (or perhaps not), she finds herself rescued by Joaquin Phoenix’s Bruno Weiss, a shady showman scouting the new arrivals for business opportunities. What follows as Eva and Bruno leave Ellis Island and enter New York City and America proper soon becomes far more than a story about one immigrant. In Gray’s hands (and with the help of co-writer Ric Menello), “The Immigrant” transcends its own plot and becomes a tale about the perilous passage that faces those who attempt to achieve righteousness. The American Dream is not dead in the film, but detours line the route to get there. It’s Eva who most obviously treads this path with her unwavering commitment to get Magda out of the infirmary back on the island. Cotillard imbues her character with an ethereal grace, a deep-seated goodness of spirit that instantly inspires empathy. She doesn’t let Eva become simply a damsel in distress, though, letting survival instincts and lapses of judgment slip through the angelic facade. Cotillard bestows a beating heart in Eva, a character written by Gray as truly and unmistakably human. While this courtesy is most often extended to protagonists, it feels somewhat rarer and subsequently all the richer to see it rewarded to a less sympathetic character. Gray gives Joaquin Phoenix a tremendously complex character to work with in Bruno, and the actor explores him to the most cavernous reaches of his soul. What Phoenix ultimately brings forth is a man torn by many forces in his head. Bruno is undeniably motivated by a lust for money, an impulse that often sees him callously exploiting Eva for all the profit she is worth. Stemming from that impulse, he also harbors a great desire for Eva, wanting to win her favor, trust, and perhaps even love. And even in spite of how despicable his actions can be, Phoenix finds the good conscience and care electively suppressed by Bruno so as not to impede his operations. “The Immigrant” thrives on the energy of Cotillard and Phoenix plumbing the depths of their characters and yielding surprising findings as they go. Gray does not necessarily structure the film around a fabricated narrative arc, instead preferring to let events play out at the rhythm of life while Eva and Bruno crawl to supersede their circumstances. Just as the film does not subscribe to a clearly defined victim/perpetrator schema, Gray does not feel that all scenes have to clearly escalate towards some grand climax. In fact, he finds some of the most potent moments of the film just by letting his camera capture small instances of dignity or disgrace. Tensions begin to boil towards the end of “The Immigrant” with the arrival of Jeremy Renner’s Orlando, a rival for Bruno’s business and Eva’s heart. Even so, the dramatic conclusion Orlando incites is hardly the real destination of the film. Gray, unashamed to discuss God or spirituality, mulls over the very essence of sin, salvation, and redemption. Both Eva and Bruno contemplate the cosmic judgement of their actions and their worth as people, queries to which Gray offers no sweeping response – perhaps because none is really possible. Beautiful review, Marshall! Can’t wait to watch!